Joint work with Øystein Linnebo, University of Oslo. J. D. Hamkins and Ø. Linnebo, “The modal logic of set-theoretic potentialism and the potentialist maximality principles,” to appear in Review of Symbolic Logic, 2018. Abstract. We analyze the precise modal commitments of several natural varieties of set-theoretic potentialism, using tools we develop for a general model-theoretic account of potentialism, building on those of Hamkins, Leibman and Löwe (Structural connections between a forcing class and its modal logic), including the use of buttons, switches, dials and ratchets. Among the potentialist conceptions we consider are: rank potentialism (true in all larger $V_\beta$); Grothendieck-Zermelo potentialism (true in all larger $V_\kappa$ for inaccessible cardinals $\kappa$); transitive-set potentialism (true in all larger transitive sets); forcing potentialism (true in all forcing extensions); countable-transitive-model potentialism (true in all larger countable transitive models of ZFC); countable-model potentialism (true in all larger countable models of ZFC); and others. In each case, we identify lower bounds for the modal validities, which are generally either S4.2 or S4.3, and an upper bound of S5, proving in each case that these bounds are optimal. The validity of S5 in a world is a potentialist maximality principle, an interesting set-theoretic principle of its own. The results can be viewed as providing an analysis of the modal commitments of the various set-theoretic multiverse conceptions corresponding to each potentialist account. Set-theoretic potentialism is the view in the philosophy of mathematics that the universe of set theory is never fully completed, but rather unfolds gradually as parts of it increasingly come into existence or become accessible to us. On this view, the outer reaches of the set-theoretic universe have merely potential rather than actual existence, in the sense that one can imagine “forming” or discovering always more sets from that realm, as many as desired, but the task is never completed. For example, height potentialism is the view that the universe is never fully completed with respect to height: new ordinals come into existence as the known part of the universe grows ever taller. Width potentialism holds that the universe may grow outwards, as with forcing, so that already existing sets can potentially gain new subsets in a larger universe. One commonly held view amongst set theorists is height potentialism combined with width actualism, whereby the universe grows only upward rather than outward, and so at any moment the part of the universe currently known to us is a rank initial segment $V_\alpha$ of the potential yet-to-be-revealed higher parts of the universe. Such a perspective might even be attractive to a Platonistically inclined large-cardinal set theorist, who wants to hold that there are many large cardinals, but who also is willing at any moment to upgrade to a taller universe with even larger large cardinals than had previously been mentioned. Meanwhile, the width-potentialist height-actualist view may be attractive for those who wish to hold a potentialist account of forcing over the set-theoretic universe $V$. On the height-and-width-potentialist view, one views the universe as growing with respect to both height and width. A set-theoretic monist, in contrast, with an ontology having only a single fully existing universe, will be an actualist with respect to both width and height. The second author has described various potentialist views in previous work. Although we are motivated by the case of set-theoretic potentialism, the potentialist idea itself is far more general, and can be carried out in a general model-theoretic context. For example, the potentialist account of arithmetic is deeply connected with the classical debates surrounding potential as opposed to actual infinity, and indeed, perhaps it is in those classical debates where one finds the origin of potentialism. More generally, one can provide a potentialist account of truth in the context of essentially any kind of structure in any language or theory. Our project here is to analyze and understand more precisely the modal commitments of various set-theoretic potentialist views. After developing a general model-theoretic account of the semantics of potentialism and providing tools for establishing both lower and upper bounds on the modal validities for various kinds of potentialist contexts, we shall use those tools to settle exactly the propositional modal validities for several natural kinds of set-theoretic height and width potentialism. Here is a summary account of the modal logics for various flavors of set-theoretic potentialism. In each case, the indicated lower and upper bounds are realized in particular worlds, usually in the strongest possible way that is consistent with the stated inclusions, although in some cases, this is proved only under additional mild technical hypotheses. Indeed, some of the potentialist accounts are only undertaken with additional set-theoretic assumptions going beyond ZFC. 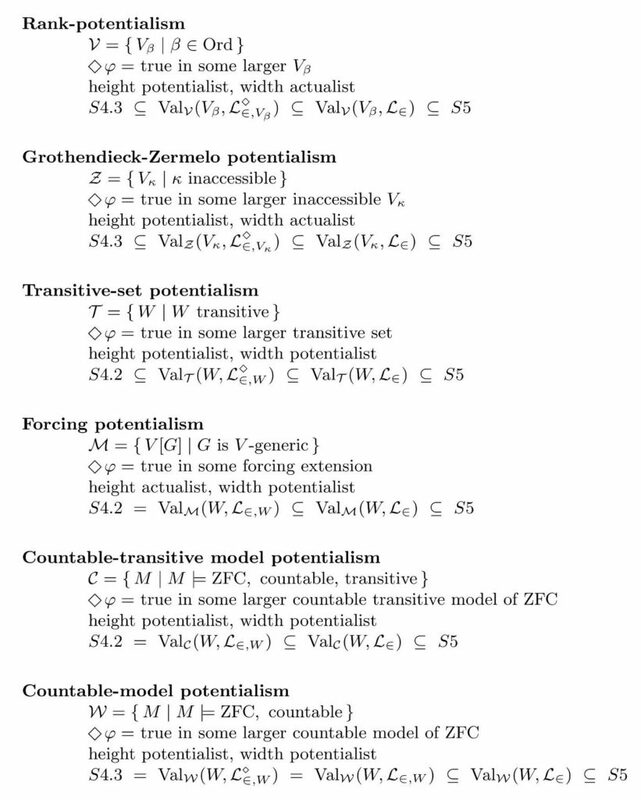 For example, the Grothendieck-Zermelo account of potentialism is interesting mainly only under the assumption that there are a proper class of inaccessible cardinals, and countable-transitive-model potentialism is more robust under the assumption that every real is an element of a countable transitive model of set theory, which can be thought of as a mild large-cardinal assumption. The upper bound of S5, when it is realized, constitutes a potentialist maximality principle, for in such a case, any statement that could possibly become actually true in such a way that it remains actually true as the universe unfolds, is already actually true. We identify necessary and sufficient conditions for each of the concepts of potentialism for a world to fulfill this potentialist maximality principle. For example, in rank-potentialism, a world $V_\kappa$ satisfies S5 with respect to the language of set theory with arbitrary parameters if and only if $\kappa$ is $\Sigma_3$-correct. And it satisfies S5 with respect to the potentialist language of set theory with parameters if and only if it is $\Sigma_n$-correct for every $n$. Similar results hold for each of the potentialist concepts. For more, please follow the link to the arxiv where you can find the full article. This entry was posted in Publications and tagged buttons+switches, correct cardinal, modal logic, multiverse, Øystein Linnebo, potentialism, reflecting cardinal, reflection by Joel David Hamkins. Bookmark the permalink.